HI I’m back for real now and sharing a new recipe before the weekend! Next week is totally back to normal – but maybe you’ve noticed a few changes around here! So I’ve had to take some time off from posting during May because I installed a brand new website from scratch. Alone. I transferred over from blogger to wordpress after close to four years there, which was a pile of work, and now I have this fancy new site that I hope you guys love. Major changes include a much improved recipe archive, a nicer contact form, an easier way to leave blog comments, and some other techy things like a quicker loading time and things like that. Also I finally have a print button for recipes for all of you who have been asking me for years to add it! Installing the site was a bit of a learning curve but I’m so proud that I managed it on my own. A few things are still on my to-do list, like getting my logo done up, fixing a couple little design things, and just aesthetic bits and pieces. 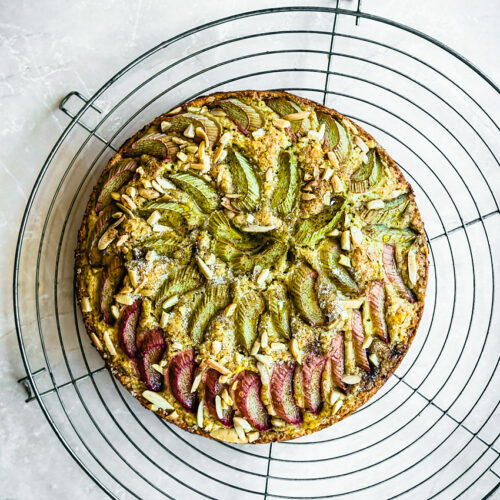 A pile of stuff has happened this month beyond doing my site redesign, so let’s catch up a bit (for those who just want to know about the recipe, scroll on down). Let’s see – Graham was officially accepted into his master’s programme, so that’s a huge deal, I am SO proud of him. I was accepted into a wonderful food stock photography agency and have had a lot of career growth over the past few weeks despite having been forced to take some time away from content creation. Most of my days have been spent in front of my computer redoing old posts to make sure links work (I’m sure some are still broken), fixing photos, and putting proper recipe cards in place. It’s been stinking hot, too, like August in May. In a place that actually has a regular amount of sunlight, hah. And this recipe. A little vegan potato salad is never a bad thing, right? 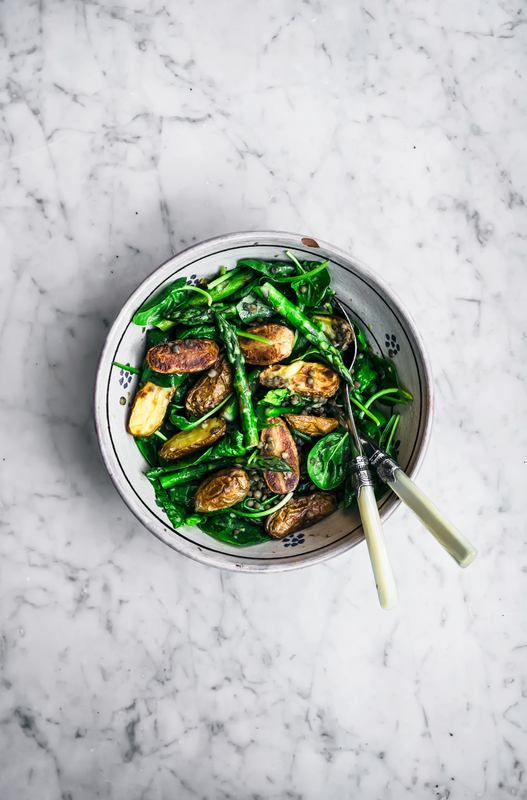 This one is adapted from my roasted new potato salad but simplified a bit, and with asparagus, the queen of spring (sorry rhubarb, still love you). For this particular version I mixed jack by the hedge, or garlic mustard, with the spinach. It’s an invasive plant in north America but native to Europe, and all over the place right now. Free greens, why not. 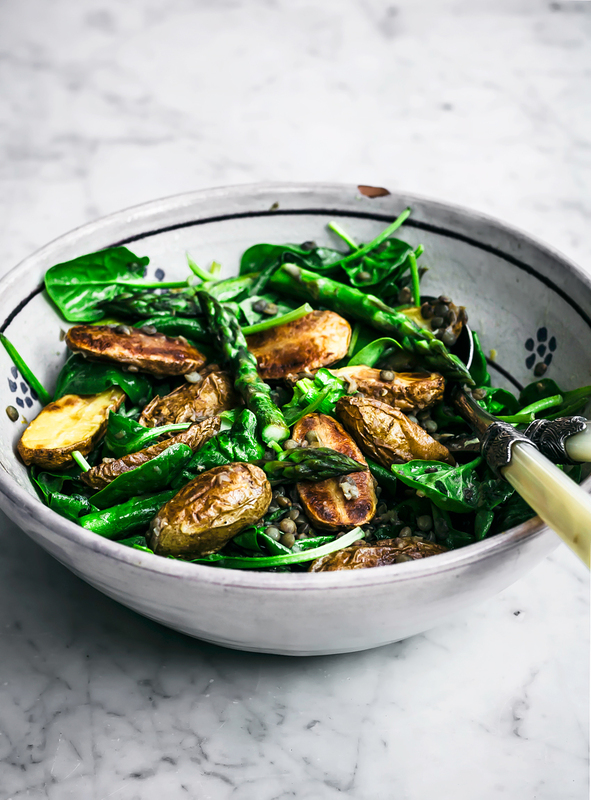 The asparagus gets tossed in with the potatoes for the last five minutes, keeping those stalks green and just the right amount of crisp, because there’s no point to mushy asparagus! 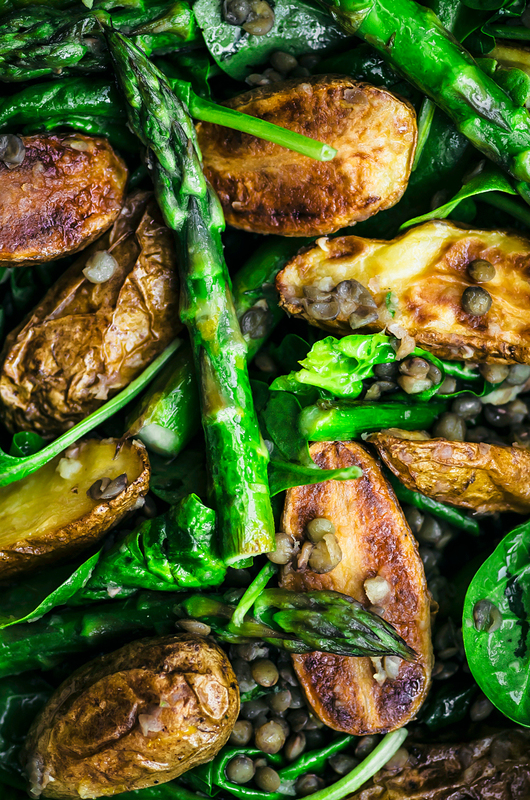 After roasting, the potatoes are tossed with fresh greens, the lentils, asparagus, and a lemon-mustard-garlic vinaigrette while the spuds are still hot. That’s the trick so make sure you don’t leave the potatoes to the side and let them cool before mixing everything up! I decided to make this recipe for 2-3 people because we’re usually two, but just double up to feed a bigger group. 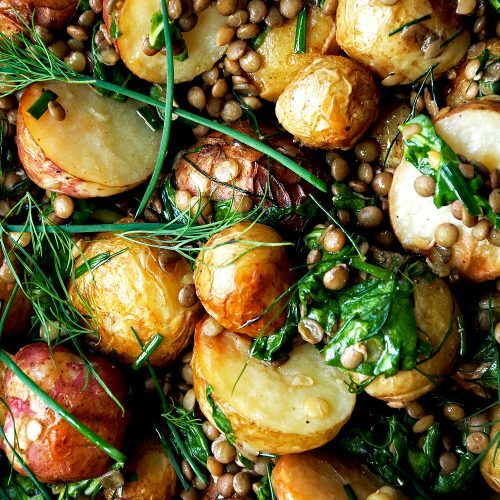 It ends up being a pretty great light dinner, with lots of lentils to fill you up, and a surprisingly balanced meal for a potato salad. If nothing else it’s a good reason to eat potato salad as a whole meal, right? Right. I’m so happy to be back in this space, I hope you love the new site! 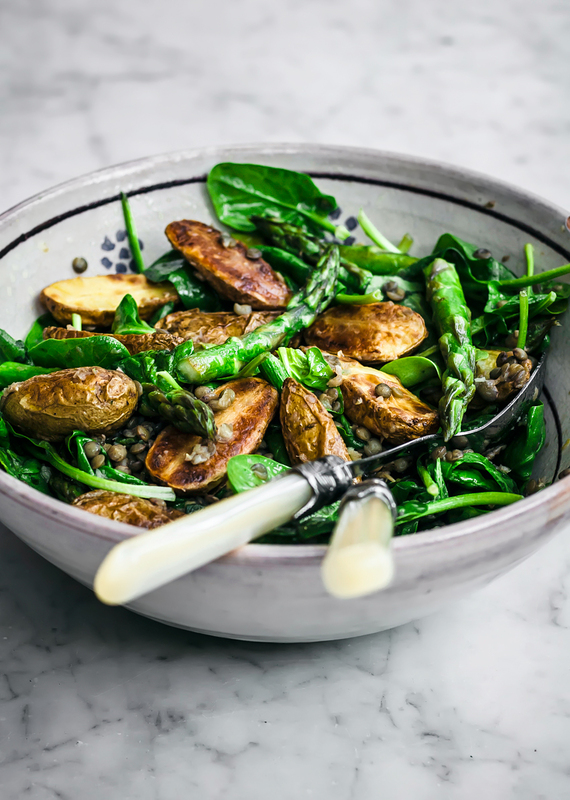 This vegan potato salad features spring asparagus, roasted new potatoes, herbs, chewy french lentils for protein, and a lemony mustard dressing. Preheat the oven to 200C / 400F. 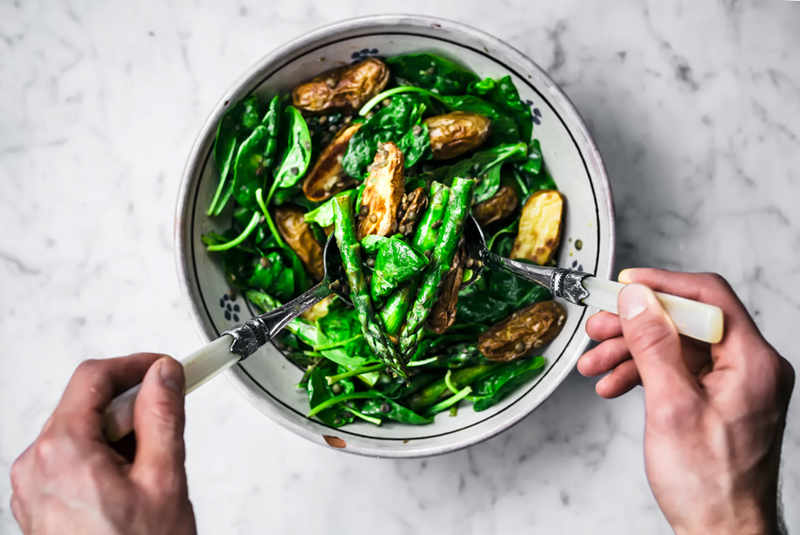 Cut the potatoes in half lengthwise if necessary so that they're all about the same size, then place onto a large baking sheet with the olive oil and salt. Mix to coat, then roast for 35-40 minutes, or until golden. Wash and trim the asparagus. In the last 5 minutes of cooking time for the potatoes, just toss the asparagus in the oven with them. They should turn bright green and soften slightly. 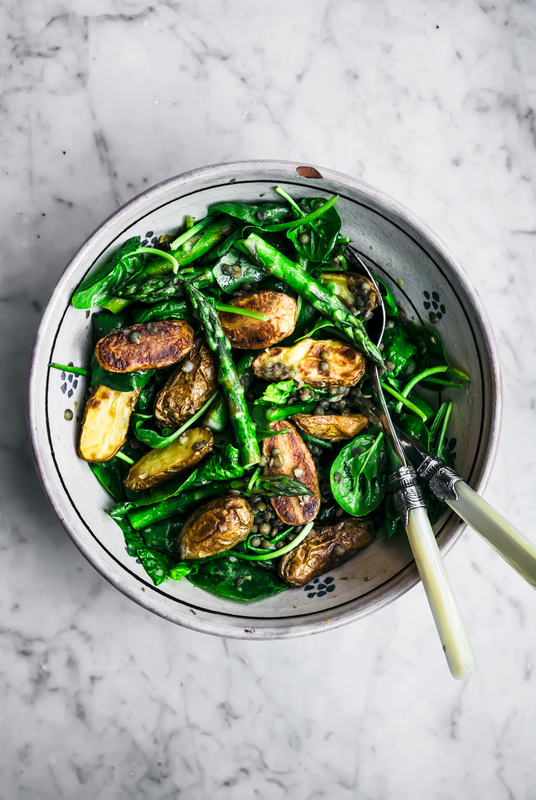 Take the potatoes and asparagus out of the oven and place them into a large bowl. Add the greens and lentils, then top with the lemon vinaigrette and stir to combine. Serve warm. Add all ingredients to a small jar or bowl and shake or whisk to combine. * The chewiness of green lentils holds up well here, but brown or beluga lentils can be used instead. ** The vinegar adds a little more acidity, which I prefer. This post was originally shared in June 2018. It was updated as of March 2019 to improve the recipe and post. Hi, Alexandra. We’re missing instructions to make this delicious looking recipe. Hey, good job with the new site! I know firsthand that moving a site over can be incredibly daunting. This recipe looks killer good–a very nourishing and flavorful one. Thanks for sharing!